The trip happened without any planning, except for a few texts to assure us that the roads were open. Then, off we were, after a lickety-split packing of essential togs, a guitar, two gallons of lambanog, two bottles of wine, digital cameras, laptops—without a check-list, missed packing the sundry of snacks, snacks and snacks—for a four-day odyssey on wheels, snaking through countless winding roads with short and long stretches of gravel, relieved by segments of paved cement, perilously slaloming around rockslides, mudslides and road repairs, while the neck cranes the other way to catch precarious glimpses of the unfolding landscape. For the intrepid travelers, rent and share a jeepney. 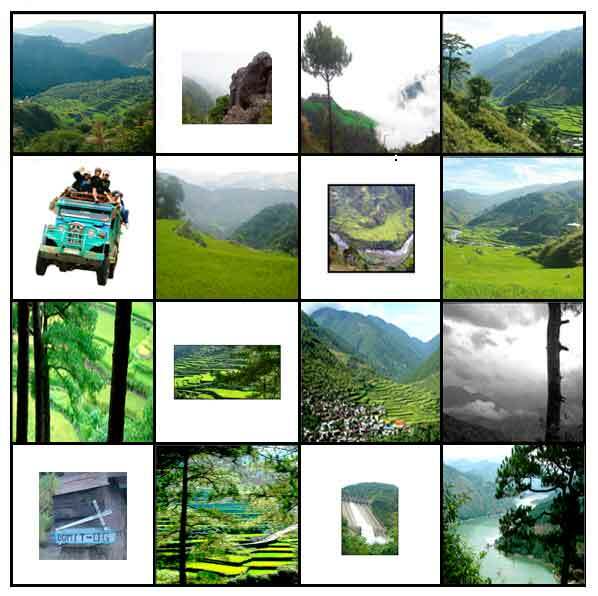 Take the loop: Baguio, Bontoc, Sagada, Banaue, throught the Cagayan Valley back to Baguio. And if you dare, do it like the locals, alfresco, on the rooftop, suffering the dust and soaking in the view. The trip looped from Baguio to Sagada through Trinidad and Bontoc, and from Sagada to Baguio through Bontoc, Banaue, Nueva Viscaya, Arilao, and the Ambuklaw Dam, done without a map, which meant getting lost a half dozen times, missing turns twice as many times, and seeking curbside directions countless times, and stopping a million times to feast on and photograph the grand Cordillera vistas of recurring rice terraces, sceneries edged with pines and wrapped by clouds, mists and fog. Sagada is the worthwhile destination, to rest your weary soul, to explore itslittlecorners of hills, caves, falls, and hanging coffins. The way to Sagada is the travel-adventure. The return trip that loops back to Baguio is well worth the dust-lading exhausting drive. This is my sixth trip to Sagada and every trip has been a different experience—a changing and serendipitous collage of mountain ranges and rice terraces, with the unpredictable wardrobe of clouds, mist, fog and rains that drapes the landscape, ephemeral and mystical. Then, there are the endless winding roads carved on mountainsides with rock faces punctuated with waterfalls, and jeepneys suddenly appearing from the around the bends, top-loaded with passengers al fresco. Below are some of the pics. But they fall short of the real experience.You have to drive Sagada. Or, see it again. It is sad if true, that more foreign tourists than Filipinos visit Sagada. And when you go, suffer the loop-around route—punishing, but rewarding. Stop those hundred times to breath the air, be engulfed by the mist and fog, and to ponder its scenic tapestry. This is the other Philippines, vast, magnificent, untrammeled and mystical.